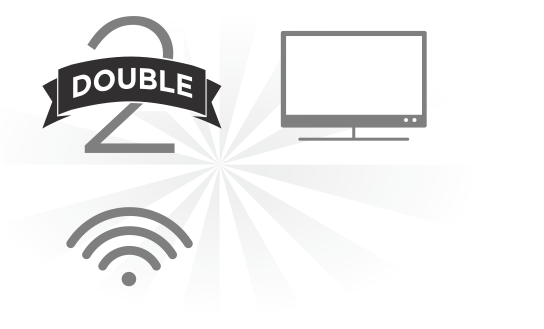 BUNDLE TV + INTERNET + PHONE AND SAVE! A Package that has it all! Geographic and service restrictions apply to AT&T services. Call or go to www.att.com to see if you qualify. $169.99 1-YR ALL INCLUDED OFFERS: End 12/31/18. Pricing: All Included TV pkg pricing includes monthly fees for HD service, one HD DVR and standard prof’l installation. $5/mo Discount: Must enroll in autopay & paperless bill within 30 days of TV activation to receive bill credit starting in 1-3 bill cycles. First time credit will include all credits earned since meeting offer requirements. Must maintain autopay/paperless bill and valid email address to continue credits. No credits in 2nd year for autopay. Pricing subj to change. Pricing: $179.99/mo for first 12 mos only Includes U450 All Included pkg ($110/mo), Internet speed tiers (10M to 100M) ($40/mo), Wi-Fi Gateway and Phone Unlimited North America ($19.99/mo). After 12 mos., then-prevailing monthly rate applies (currently $206.99/mo. ), unless cancelled or changed by customer prior to end of promo period. Must maintain all qualifying services and service addresses must match to receive advertised pricing. Exclusions: Price excludes applicable use tax expense surcharge on retail value of installation, custom installation, equip upgrades/add-ons (each add’l receiver $10/mo) & other charges, including Broadcast Fee (up to $5.99/mo), a federal regulatory video cost recovery chrg and city video cost recovery fees. Credit restrictions apply. Different offers may apply for eligible multi-dwelling unit customers. †Must maintain a bundle of TV and Internet on a combined bill in order to receive unlimited data allowance at no add'l charge. Fro more info, go to www.att.com/Internet-usage AT&T PHONE: AT&T Phone service is provided over an Internet Protocol connection and powered by electricity in your home. AT&T Phone service including 911 dialing, will not function during a power outage without battery backup power. It is your responsibility to purchase any necessary battery backup units for your service. See att.com/batterybackup. Phone Unlimited North America: Includes unlimited nationwide calling within the U.S., plus calls to Canada, Mexico and U.S. Territories. International calls billed at additional per minute rates. An additional per minute rate may apply for international calls terminating on mobile phones. All Offers: Offers may not be combined with other promotional offers on the same services and may be modified or discontinued at any time without notice. Other conditions apply to all offers. $94.99 1-YR ALL INCLUDED OFFERS: End 12/31/18. Pricing: All Included TV pkg pricing includes monthly fees for HD service, one HD DVR and standard prof’l installation. $5/mo Discount: Must enroll in autopay & paperless bill within 30 days of TV activation to receive bill credit starting in 1-3 bill cycles. First time credit will include all credits earned since meeting offer requirements. Must maintain autopay/paperless bill and valid email address to continue credits. No credits in 2nd year for autopay. Pricing subj to change. Pricing: $94.99/mo for first 12 mos only Includes U-family All Included pkg ($35/mo), Internet ($40/mo) for Internet speed tiers (10M to 100M), Wi-Fi Gateway and Phone Unlimited North America ($19.99/mo). After 12 mos., then-prevailing monthly rate applies (currently $140.99/mo. ), unless cancelled or changed by customer prior to end of promo period. Must maintain all qualifying services and service addresses must match to receive advertised pricing. Exclusions: Price excludes applicable use tax expense surcharge on retail value of installation, custom installation, equip upgrades/add-ons (each add’l receiver $10/mo) & other charges, including Broadcast Fee (up to $5.99/mo), a federal regulatory video cost recovery chrg and city video cost recovery fees. Credit restrictions apply. Different offers may apply for eligible multi-dwelling unit customers. †Must maintain a bundle of TV and Internet on a combined bill in order to receive unlimited data allowance at no add'l charge. AT&T PHONE: AT&T Phone service is provided over an Internet Protocol connection and powered by electricity in your home. AT&T Phone service including 911 dialing, will not function during a power outage without battery backup power. It is your responsibility to purchase any necessary battery backup units for your service. See att.com/batterybackup. Phone Unlimited North America: Includes unlimited nationwide calling within the U.S., plus calls to Canada, Mexico and U.S. Territories. International calls billed at additional per minute rates. An additional per minute rate may apply for international calls terminating on mobile phones. All Offers: Offers may not be combined with other promotional offers on the same services and may be modified or discontinued at any time without notice. Other conditions apply to all offers. Geographic and service restrictions apply to AT&T services. $114.99 1-YR ALL INCLUDED OFFERS: End 12/31/18. Pricing: All Included TV pkg pricing includes monthly fees for HD service, one HD DVR and standard prof’l installation. $5/mo Discount: Must enroll in autopay & paperless bill within 30 days of TV activation to receive bill credit starting in 1-3 bill cycles. First time credit will include all credits earned since meeting offer requirements. Must maintain autopay/paperless bill and valid email address to continue credits. No credits in 2nd year for autopay. Pricing subj to change. Pricing: $114.99/mo for first 12 mos only Includes U200 All Included pkg ($55/mo), Internet ($40/mo) for Internet speed tiers (10M to 100M), Wi-Fi Gateway and Phone Unlimited North America ($19.99/mo). After 12 mos., then-prevailing monthly rate applies (currently $161.99/mo. ), unless cancelled or changed by customer prior to end of promo period. Must maintain all qualifying services and service addresses must match to receive advertised pricing. Exclusions: Price excludes applicable use tax expense surcharge on retail value of installation, custom installation, equip upgrades/add-ons (each add’l receiver $10/mo) & other charges, including Broadcast Fee (up to $5.99/mo), a federal regulatory video cost recovery chrg and city video cost recovery fees. Credit restrictions apply. Different offers may apply for eligible multi-dwelling unit customers. †Must maintain a bundle of TV and Internet on a combined bill in order to receive unlimited data allowance at no add'l charge. AT&T PHONE: AT&T Phone service is provided over an Internet Protocol connection and powered by electricity in your home. AT&T Phone service including 911 dialing, will not function during a power outage without battery backup power. It is your responsibility to purchase any necessary battery backup units for your service. See att.com/batterybackup. Phone Unlimited North America: Includes unlimited nationwide calling within the U.S., plus calls to Canada, Mexico and U.S. Territories. International calls billed at additional per minute rates. An additional per minute rate may apply for international calls terminating on mobile phones. All Offers: Offers may not be combined with other promotional offers on the same services and may be modified or discontinued at any time without notice. Other conditions apply to all offers. Geographic and service restrictions apply to AT&T services.$119.99 1-YR ALL INCLUDED OFFERS: End 12/31/18. Pricing: All Included TV pkg pricing includes monthly fees for HD service, one HD DVR and standard prof’l installation. $5/mo Discount: Must enroll in autopay & paperless bill within 30 days of TV activation to receive bill credit starting in 1-3 bill cycles. First time credit will include all credits earned since meeting offer requirements. Must maintain autopay/paperless bill and valid email address to continue credits. No credits in 2nd year for autopay. Pricing subj to change. Pricing: $119.99/mo for first 12 mos only Includes U300 All Included pkg ($60/mo), Internet ($40/mo) for Internet speed tiers (10M to 100M), Wi-Fi Gateway and Phone Unlimited North America ($19.99/mo). After 12 mos., then-prevailing monthly rate applies (currently $189.99/mo. ), unless cancelled or changed by customer prior to end of promo period. Must maintain all qualifying services and service addresses must match to receive advertised pricing. Exclusions: Price excludes applicable use tax expense surcharge on retail value of installation, custom installation, equip upgrades/add-ons (each add’l receiver $10/mo) & other charges, including Broadcast Fee (up to $5.99/mo), a federal regulatory video cost recovery chrg and city video cost recovery fees. Credit restrictions apply. Different offers may apply for eligible multi-dwelling unit customers. †Must maintain a bundle of TV and Internet on a combined bill in order to receive unlimited data allowance at no add'l charge. AT&T PHONE: AT&T Phone service is provided over an Internet Protocol connection and powered by electricity in your home. AT&T Phone service including 911 dialing, will not function during a power outage without battery backup power. It is your responsibility to purchase any necessary battery backup units for your service. See att.com/batterybackup. Phone Unlimited North America: Includes unlimited nationwide calling within the U.S., plus calls to Canada, Mexico and U.S. Territories. International calls billed at additional per minute rates. An additional per minute rate may apply for international calls terminating on mobile phones. All Offers: Offers may not be combined with other promotional offers on the same services and may be modified or discontinued at any time without notice. Other conditions apply to all offers. Geographic and service restrictions apply to AT&T services. Call or go to www.att.com to see if you qualify. $84.99 1-YR BUNDLE PRICE: Ends 3/31/18. Pricing: $84.99/mo for first 12 mos. only. After 12 mos, or loss of eligibility, then prevailing rate applies (currently $130.99/mo), unless cancelled or changed prior to end of promo period. Must maintain all qualifying services to receive advertised pricing. Pricing subject to change.vMust enroll in autopay w/in 30 days of TV activation to receive bill credit starting in 1-3 bill cycles. First time credit will include all credits earned since meeting offer requirements. No credits in 2nd year for autopay. Includes: U-Family All-Included Pkg., Internet plans (768k-50M), and Phone Unlimited North America, HD service, monthly equip fees for 1 HD DVR, a Wi-Fi Gateway, and standard pro installation. Exclusions: Price excludes applicable use tax expense surcharge on retail value of installation, custom installation, equip upgrades/add-ons (each add’l receiver $10/mo) & other charges, including Broadcast Fee (up to $5.99/mo), a federal regulatory video cost recovery chrg and city video cost recovery fees. Credit restr’s apply. Different offers may apply for eligible multi-dwelling unit and telco customers. Pricing, programming, features subj to change at any time without notice. $104.99 1-YR BUNDLE PRICE: Ends 3/31/18. Pricing: $104.99/mo for first 12 mos. only. After 12 mos, or loss of eligibility, then prevailing rate applies (currently $151.99/mo), unless cancelled or changed prior to end of promo period. Must maintain all qualifying services to receive advertised pricing. Pricing subject to change. Autopay Credit: Must enroll in autopay w/in 30 days of TV activation to receive bill credit starting in 1-3 bill cycles. First time credit will include all credits earned since meeting offer requirements. No credits in 2nd year for autopay. Includes: U200 All-Included Pkg., Internet plans (768k-50M), and Phone Unlimited North America, HD service, monthly equip fees for 1 HD DVR, a Wi-Fi Gateway, and standard pro installation. Exclusions: Price excludes applicable use tax expense surcharge on retail value of installation, custom installation, equip upgrades/add-ons (each add’l receiver $10/mo) & other charges, including Broadcast Fee (up to $5.99/mo), a federal regulatory video cost recovery chrg and city video cost recovery fees. Credit restr’s apply. Different offers may apply for eligible multi-dwelling unit and telco customers. Pricing, programming, features subj to change at any time without notice. $109.99 1-YR BUNDLE PRICE: Ends 3/31/18. Pricing: $109.99/mo for first 12 mos. only. After 12 mos, or loss of eligibility, then prevailing rate applies (currently $168.99/mo), unless cancelled or changed prior to end of promo period. Must maintain all qualifying services to receive advertised pricing. Pricing subject to change. Autopay Credit: Must enroll in autopay w/in 30 days of TV activation to receive bill credit starting in 1-3 bill cycles. First time credit will include all credits earned since meeting offer requirements. No credits in 2nd year for autopay. Includes: U300 All-Included Pkg., Internet plans (768k-50M), and Phone Unlimited North America, HD service, monthly equip fees for 1 HD DVR, a Wi-Fi Gateway, and standard pro installation. Exclusions: Price excludes applicable use tax expense surcharge on retail value of installation, custom installation, equip upgrades/add-ons (each add’l receiver $10/mo) & other charges, including Broadcast Fee (up to $5.99/mo), a federal regulatory video cost recovery chrg and city video cost recovery fees. Credit restr’s apply. Different offers may apply for eligible multi-dwelling unit and telco customers. Pricing, programming, features subj to change at any time without notice. $179.99 1-YR BUNDLE PRICE: Ends 3/31/18. Pricing: $179.99/mo for first 12 mos. only. After 12 mos, or loss of eligibility, then prevailing rate applies (currently $216.99/mo), unless cancelled or changed prior to end of promo period. Must maintain all qualifying services to receive advertised pricing. Pricing subject to change. Autopay Credit: Must enroll in autopay w/in 30 days of TV activation to receive bill credit starting in 1-3 bill cycles. First time credit will include all credits earned since meeting offer requirements. No credits in 2nd year for autopay. Includes: U450 All-Included Pkg., Internet 75M plan, and Phone Unlimited North America, HD service, monthly equip fees for 1 HD DVR, a Wi-Fi Gateway, and standard pro installation. Exclusions: Price excludes applicable use tax expense surcharge on retail value of installation, custom installation, equip upgrades/add-ons (each add’l receiver $10/mo) & other charges, including Broadcast Fee (up to $5.99/mo), a federal regulatory video cost recovery chrg and city video cost recovery fees. Credit restr’s apply. Different offers may apply for eligible multi-dwelling unit and telco customers. Pricing, programming, features subj to change at any time without notice. †Must maintain a bundle of TV and Internet on a combined bill in order to receive unlimited data allowance at no add’l charge. For more info, go to www.att.com/internet-usage.